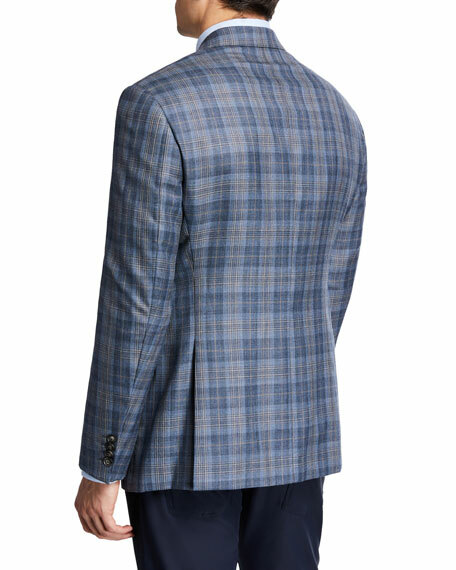 Emporio Armani plaid sport coat. Side flap pockets; chest welt pocket. 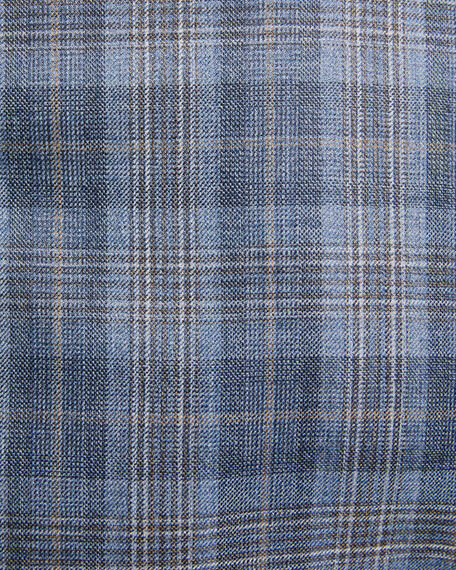 Emporio Armani jacket in two-tone large district check. Notched collar; two-button front. Four-button sleeve finish. Chest welt pocket. Flap pockets at hips. Double back vent. Wool. Imported. Model's measurements: Height, 6'1"/185cm, Suit 40L, Shirt 14.5 x 34.5, Waist 32"/81cm, Inseam 32"/81cm. Emporio Armani dinner jacket in diamond design. Satin peak lapel; hand-stitched silk button hole. Side besom pockets; chest welt pocket. Emporio Armani dinner jacket in diamond design. Satin peak lapel; hand-stitched silk button hole. Side besom pockets; chest welt pocket. Cuffs with four-button detail. Double-vented back. Virgin wool. Viscose lining. Dry clean. Imported. Emporio Armani napa sheep leather bomber jacket. Stand collar; full-zip front. Side slip pockets. Long sleeves. Ribbed hem and cuffs. Emporio Armani napa sheep leather bomber jacket. Stand collar; full-zip front. Side slip pockets. Long sleeves. Ribbed hem and cuffs. Lamb leather/polyester/spandex. Imported. Model's measurements: Height, 6'1"/185cm, Suit 40R, Shirt 15.5 x 34, Waist 31"/79cm, Inseam 32"/81cm. 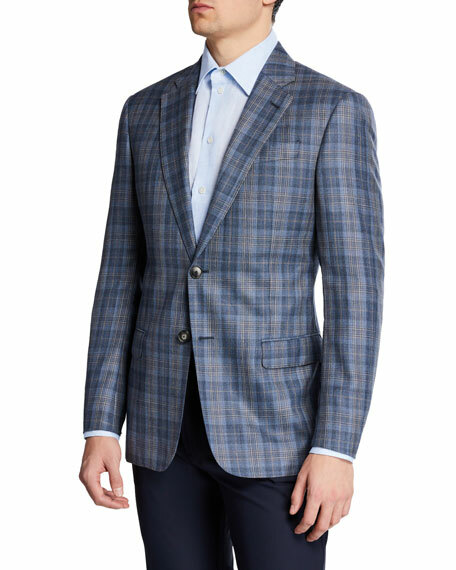 Emporio Armani sport coat jacket in small check. Notched lapel; two-button front. Finished sleeves; four-button detail. Chest welt pocket. Patch pockets at hips. Double vented back. Virgin wool; lining, viscose. Made in Bulgaria. Model's measurements: Height, 6'1"/185cm, Suit 40L, Shirt 14.5 x 34.5, Waist 32"/81cm, Inseam 32"/81cm.